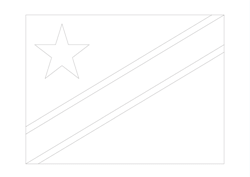 Download your free Democratic Republic of the Congo flag coloring page here. We have the most common formats for standard printers available. We have coloring pages of the flag of the Democratic Republic of the Congo in A4 size but also in a A3 format. These high-quality coloring pages may be used free of charge for non-commercial purposes. Click on the file and save it for free.